Place bets from as little as £0.01 on the UK’s favourite cute and cuddly mobile slot offering a jackpot of 5,000 coins, and frequent pay outs with a 95.3% RTP. Amigo Slots are proud to host Fluffy Favourites, developed by Eyecon along with hundreds of other mobile slots. Fluffy Favourites has been one of the UK’s favourite online slot games since it was released by Eyecon in 2006. Even though there have been thousands of online slot games released since then, the unique charm of Fluffy Favourites still continues to win over new players and loyal players to the game who enjoy the frequent wins and the excitement of the prospect of cashing out on the jackpot. While Fluffy Favourites certainly isn’t the flashiest online slot on Amigo Slots, plenty of people spin the reels for the light and breezy charm of the game which hits you with a sense of childhood nostalgia every time you spin the reels on the 5 x 3 reel slot set up. There are 25 bet lines to play on with every spin, so for those who are looking for more frequent wins, you can boost your chances by betting on all 25 pay lines. Yet, a major selling point of Fluffy Favourites is the low betting ranges which allow you to place a bet from as little as £0.01. Most popular online slot games only let you bet as low as 25p or 50p, yet with Fluffy Favourites there’s hours of fun to be had if you’re playing with a small budget. If you’re lucky enough to cash out with the 5,000 coin jackpot your budget won’t be all that small! The maximum stake amount for Fluffy Favourites is capped to £0.50, so if you’re a high roller, you may want to consider another of the games we feature on Amigo Slots. If you’re looking for high quality graphics you may want to consider other games than Fluffy Favourites, yet for any one who appreciates the nostalgic charm of retro videogames there’s no better option than Eyecon’s most popular slot game. Fluffy Favourites will take you right back to your youth spending time cruising the arcades or frequenting summer fairs which always came with the promise of walking away with the cuddly toy you set your sights on. As we grow older, the desire to collect cute and cuddly toys may diminish, yet, for many the desire to win isn’t lost. Even though it may have been frustratingly hard to win at the arcade, with Fluffy Favourites you will enjoy the average return to player rate of 95.39%, while there are other higher RTPs out there, there are plenty of bonus features which make up for the average RTP. At the time of publishing Fluffy Favourites, the graphics and the game play were considered ahead of their time. Yet, in comparison with the other online slots we feature on Amigo Slots they can appear slightly dated – so we’d recommend the later releases from the Fluffy Favourites franchise instead of Fluffy Favourites. The online slot is set to the colourful backdrop of a summer fair located in a sparse field as the sun and a rainbow collide in the sky over a colourful big tent. The 5 x 3 reels occupy most of the screen and feature a host of cuddly toy animals which you’d expect to see for grabs at an arcade. As dated as the design of Fluffy Favourites is, there are still very few online slots which are as easy to the eye as Fluffy Favourites, even after hours of playing your eyes won’t get tired and there are no high-intensity graphics to take in – all you need to do is follow the reels as the endearing characters slot into place. While many themed online slots go the extra mile when it comes to the soundtrack, Eyecon kept it fairly minimal with Fluffy Favourites which offers no music, just the sound as you hit spin and the reels as they turn and slot into place. The blaring arcade bells will let you know when you hit a win which will invoke the same feeling of ecstasy you enjoyed at the arcade. There are no standard characters on Fluffy Favourites, instead, each of the symbols on the reels are different colourful characters. Even though they are all equally as adorable, each symbol has a different value if matched on a winning bet line. In order from the highest valued symbol to the lowest valued symbol, the symbols are as follows hippo, dragon, gorilla, panda, lion, turtle, giraffe, rhino, duck and goldfish. Aside from the main symbols in Fluffy Favourites, the online slot features scatter and wild symbols. The toy claw is the scatter symbol and will enter you into a side bonus game which is separate from the main game play. Acting as both a wild and scatter symbol is the pink elephant which has the ability to replace all other symbols on the reels to give you a little helping hand to form a winning pay line. The pink elephant can also enter you into a bonus round. Fluffy favourites offers a fixed grand jackpot of 5000x your bet line, the jackpot will be yours in you land five hippos on a bet line. There is also the major jackpot to play for which comes in at 1000x your bet line. To cash out with the major jackpot you’ll need to find five dragon symbols on the reels. To make the free spins round even more exciting, you’ll also be able to play with the gambling feature which can hit the money you have won in the free spins round with a 3x multiplier! There’s a lot to remember when it comes to the game play with Fluffy Favourites, so for a lot of people working with such a high amount of bonus features can be a little daunting. We’ve provided a list of alternative games which are available to play on Amigo Slots down below. 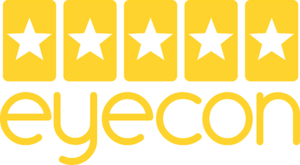 Eyecon are currently one of the online slot industry’s biggest names. Their classic games which are now over ten years old still retain popularity while their new slots attract more and more customers each day. Eyecon’s story began in 1997 as they set themselves up as a computer game company who didn’t intend on being an online slot company, instead they made their debut with the popular game ‘Gore’. It’s safe to say that Gore was a hit after the game received millions of downloads after the release. It wasn’t long until Eyecon tried their hands at online slots, their first slot game ‘Temple of Iris’ was released in 2003, yet, their name didn’t become synonymous with success until 2006 when Eyecon released Fluffy Favourites. Even though the game is now a decade old, it’s popularity isn’t likely to diminish any time soon. Even though Eyecon have created a plethora of cute and cuddly online slots, it seems that there was a key ingredient in the game which Eyecon can’t even recreate. It should come as no surprise that Eyecon were keen to develop more games similar to Fluffy Favourites. Currently, Eyecon’s cute and cuddly games are the most popular on the market, while their portfolio includes many of the most popular toy-themed games, they have also catered to plenty of other niches such as fantasy, sports, action and adventure and mythology. A full list of their games can be seen on their website, below we have covered three of the other games in the Fluffy Favourites series. Each of the different games has special features to enjoy and different specs to learn, we’ve outlined all of the key information to help you choose the best slot to play. Remember, you can always play the online slots for free via Eyecon’s website before you place a bet on Amigo Slots. Fluffy Too Online Slot by Eyecon: If you loved Fluffy Favourites, there’s a high chance that you will love Fluffy Too! The online slot offers 25 bet lines as you enjoyed with Fluffy Favourites. The return to player rate is also the same at 95.39%, however the real difference can be seen with the graphics – they’ve certainly been brought into the 21st century and had a polish to give the online slot a more vibrant and contemporary feel. Fluffy Too operates on 5 x 3 reels and offers similar bonus rounds and features, yet, instead of the Toy Box Pick round, the bonus round takes the form of the cascade penny slot games. Instead of hoping for a prize of a handful of 2ps, you will win 100x your stake amount and up to 400 free spins. Fluffy Fairground by Eyecon: Step into the big tent with Fluffy Fairground which offers 95.39% RTP and an obscenely exciting prospect of winning up to 100x your original stake amount. There are also plenty of free spins to get your hands on in the 5 x 3 reel slot which was inspired by the perpetually popular fairground game hook a duck. Instead of going home with a goldfish which would either last for a day or last forever, you’ll get to enjoy a range of exciting features on the inventively set up slot. The set up may take a little while to get used to, yet, with the 50 / 50 gamble feature which presents itself at the end of the bonus rounds, it’s more than worth getting to grips with it. Fluffy Favourites Progressive Jackpot by Eyecon: While the jackpots on Fluffy Favourites are fixed to 5000 coins, with the Fluffy Favourites Progressive Jackpot game the jackpot amount just keeps on growing! With the Fluffy Favourites Progressive Jackpot Game, you’ll see all the fun features which Fluffy Favourites offered in addition to the constantly growing jackpot amount. If you’re feeling lucky, there really is no better game to play. Aside from the exciting prospect of the progressive jackpot, you’ll still see plenty of regular wins with the return to player rate which is set to the same as Fluffy Favourites at a rate of 93.5%. If you scour through the top fluffy and cute online slot games, you’ll have to look far past the releases of Eyecon to find remarkable releases from other game developers. Even though plenty of game developers have tried their best to capture the distinctive allure of Fluffy Favourites, many players found it hard to tear themselves away from the game. But here are the top three other games which are available to play for cash today. 7 Piggies by Pragmatic Play: Okay, so 7 Piggies isn’t the cutest online slot there is, but the cheeky charm of the pigs will be enough to leave some reel spinners enamoured. Each of the symbols which appear on the reels really does have their own character making it all too easy to be endeared with the immersive game. 7 Piggies is the better option for players who are looking for a simpler game play experience as there are only 7 different bet lines to play on and there’s a slightly higher return to player rate which is set to 95.99%. The maximum win from 7 Piggies is 1500x your stake amount. Teddy Pets by Microgaming: You know how tatty teddy bears have an infinite amount of appeal? That’s exactly what Bwin.Party played with when they come up with the Teddy Pets online slot which offers players 20 bet ways over the 5 x 3 slots and a medium-range return to player rate of 95.14%. Yet, by far the most impressive thing about Teddy Pets is the 40,000 coin jackpot, which offers significantly more than Fluffy Favourites. Teddy Pets also includes an impressive variance of bonus rounds, free spins, scatters and wild symbols. Gift Shop by Play N Go: Players of traditional land-based online slots will absolutely adore the set up of Gift Slot which is by far the best game for players who are new to online slots to play. Instead of the 5 x 3 reel set up of Fluffy Favourites Gift Shop has a much simpler 3 x 1 set up. As there is only one row to play on, there is only one bet line on Gift Shop which drives down the return to player rate to 94.12%. The maximum jackpot is set to 1600 coins due to the limited amount of bet lines, yet, for anyone who is looking for the simplest online slot experience there is, Gift Shop certainly shouldn’t be over looked – it is perfect for anyone who found the amount of wilds, scatters and bonus rounds in Fluffy Favourites a little daunting. You can be assured by the popularity of Fluffy favourites that it is the perfect game to play via mobile and laptop/desktop. While the graphics of many online slot games can be compromised by being squeezed down to fit into a 4” screen, that is certainly not the case when it comes to Fluffy Favourites. Even though Fluffy Favourites is easily ten years older than the phones which people choose to play on, it still holds up remarkably well. However, you may find yourself with the preference to play in portrait mode as some phones will find it hard to rotate the game effectively. Even though Fluffy Favourites was released in 2006, the online slot is never all too far away from the media. Why is Amigo Slots the Best Place to Play Fluffy Favourites?